The chemical element sulfur is classed as a chalcogen and a nonmetal. It has been known since ancient times. Its discoverer and discovery date are unknown. Most health benefits from onions and garlic come from sulfur compounds. 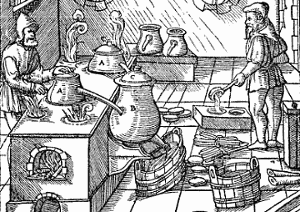 Ancient sulfur refining: Sulfur ore is heated in pots whose lids fit tightly to limit the release of SO2. (The modern short-term exposure limit for SO2 is 5 ppm. (12) ) Liquid sulfur is collected below the pots. Georgius Agricola, 1556. Sulfur has been known since ancient times. In the Bible it is called brimstone. It can be found in its elemental state around volcano vents. The sulfur obtained from molten sulfur is called monoclinic sulfur, while sulfur obtained from crystallizing a solution is called rhombic sulfur. Both forms consist of S8 rings. The difference between the forms is the way the rings are arranged within a crystal. By the 1800s sulfur, in the form of sulfuric acid, had become the best way to judge a country’s wealth. Countries had even gone to war over sulfur. “It is no exaggeration to say, we may fairly judge the commercial prosperity of a country from the amount of sulfuric acid it consumes. Sulfur makes up almost 3% of the earth’s mass. If you think that’s not much, next time you look to the sky and see the moon, think of this: the earth contains enough sulfur to make not just one new moon, but two! Pure sulfur has no smell, but many of its compounds stink! For example sulfur compounds called mercaptans give skunks their awful smell. Rotten eggs (and most stink bombs) get their distinctive aroma courtesy of hydrogen sulfide, H2S. Certain cave bacteria digest hydrogen sulfide and produce snottites (think of slimy stalactites) in caves. These snottites drip sulfuric acid with a pH as low as zero – that’s enough to burn holes in your clothes if you stand underneath them. Snottite bacteria thrive in areas where there are sulfur deposits or sulfur-containing minerals or hydrocarbons. The sulfuric acid they excrete carves out new cave systems underground by dissolving rocks. There’s a much higher proportion of sulfur in the earth’s core than in its crust – approximately 100 times more. Penicillin is a natural, sulfur-based antibiotic. Sulfur reacts very vigorously with zinc. Here’s a test firing of a sulfur/zinc rocket. Elemental sulfur is considered to be of low toxicity. Sulfur is a soft, pale yellow, odorless, brittle solid. It is insoluble in water, but soluble in carbon disulfide. It burns with a blue flame, oxidizing to sulfur dioxide. Sulfur exists in several crystalline and amorphous allotropes. The most common form is yellow, orthorhombic alpha-sulfur, which contains puckered rings of S8. Sulfur is multivalent and combines, with valence 2, 4, or 6, with almost all other elements. The best known sulfur compound is hydrogen sulfide (H2S). This is a toxic gas that smells like rotten eggs; the smell is used in stink bombs, many of which release a small amount of hydrogen sulfide. Sulfur’s main commercial use is as a reactant in the production of sulfuric acid (H2SO4). Sulfuric acid is the industrialized world’s number one bulk chemical, required in large quantities in lead-acid batteries for automotive use. Sulfur is also used in the vulcanization of natural rubber, as a fungicide, in black gunpowder, in detergents and in the manufacture of phosphate fertilizers. Sulfur is a vital element for all forms of life. It is a component of two amino acids, cysteine and methionine. 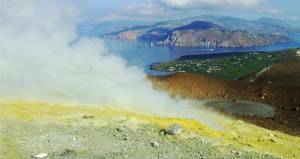 Source: Sulfur deposits are found naturally in areas around hot springs and in volcanic regions. It is also widely found in nature as iron pyrites (iron sulfide), galena (lead sulfide), gypsum (calcium sulfate), Epsom salts (magnesium sulfate) and many other minerals. Sulfur is recovered commercially from underground deposits using the Frasch Process – superheated water and steam are pumped underground, where they melt the sulfur, allowing it to be pumped to the surface. Sulfur is also obtained commercially as a by-product of refining crude oil. Isotopes: Sulfur has 18 isotopes whose half-lives are known, with mass numbers 27 to 45. Naturally occurring sulphur is a mixture of its four stable isotopes and they are found in the percentages shown: 32S (95.0%), 33S (0.8%), 34S (4.2%), and 36S (0.02%). G. Eggert, M. Weichert, H. Euler, B. Barbier, Some news about Black Spots., 2004, Proceedings of Metal, p142 (pdf download). Rick Briggs, Knowledge Representation in Sanskrit and Artificial Intelligence., AI Magazine Volume 6 Number 1, 1985, p32. Cyrus Edson, Disinfection of Dwellings by Means of Sulphur Dioxide., Public Health Pap Rep., 1889, 15: p65-68. Thomas F. Glick, Steven John Livesey, Faith Wallis, Dioxide, Medieval Science, Technology, and Medicine: An Encyclopedia., 2005, p211, Routelidge. Charles Stephenson, The Admiral’s Secret Weapon: Lord Dundonald and the Origins of Chemical Warfare., p93, Boydell Press. Antoine Lavoisier, Elements of Chemistry at Project Gutenberg 1790, Translation of the original 1789 French by Robert Kerr. Hans-Werner Schütt, Eilhard Mitscherlich, Prince of Prussian Chemistry., p98, Chemical Heritage Foundation. William B. Jensen, The Origin of the Term Allotrope., J. Chem. Educ., 2006, 83 (6), p838. Justus Freiherr von Liebig, Familiar Letters on Chemistry.,	1843. Why does chopping an onion make you cry?, Library of Congress. Toxicity of hydrogen sulfide gas. "Sulfur." Chemicool Periodic Table. Chemicool.com. 18 Oct. 2012. Web. I really like this article. Short sweet information. Helped me put two and two together. Thank you. this was perfect, had all the info i needed, thanks! thanks this was really helpful for me on my school project!!!! I am working on a project for school and this was so very helpful. this web site is very good for science class. its helpful to others and, to me!!! !